This is F Male standard, suitable for any ATSC TV system's countries, mostly use for US. 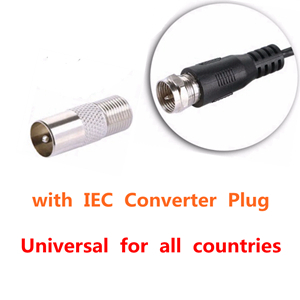 EU and other PAL TV system's countries needs to use with IEC converter plug. So this antenna can use for all countries. Innovative flat, razor-thin antenna design. It has high gain and low error rate digital tv signal reception,and a significant signal enhancement in actual use. Increase the reception of tv programs, and eliminate the pause the mosaic images. Fast and easy to set up -Unwrap,plug it in and Scan channels. You can put it on the wall, on the table or on the window (strongly recommended) and it will make you enjoy watching crystal clear digital &HD shows with many opportunities. Step1: Connect the end of attached coaxial cable to the ANT/IN connector on the back of the TV or Digital Converter Box,Plug the USV plug into the USB port of the TV or Digital Converber Box. Step 2: Hand held the antenna, near the window, place it horizontally or vertically. Step 3: In the TV’ s or STB ’ s setup menu, set the tuner mode to “ Antenna ” or “ Air ” For more detailed instructions, please refer to your TV manual. Step 4: In the TV’ s or STB ’ s setup menu, set TV to “ scan ” for channels. This can sometimes be listed as auto-program,auto-scan,channel search or channel scan. Consult the TV manual or detailed instructions. Step 5: If reception is sporadic, try moving the antenna to another location and rescanning the TV until optimal postition is found. Connect the antenna to TV properly. Set TV to Antenna mode. When the signal quality is low, adjust the location of the antenna or rotate it towards television station. you an watch the clear tv program until the signal quality gets improved. for the best reception, please check the following tips. This digital hdtv antenna is intended for indoor use only. Placing the antenna higher or close to/in a window may result in better reception. You must rescan whenever you move the antenna. Keep the antenna away from any sources of interference: keep the antenna away from those big power consumption devices, such as air conditioner elevator, hairdryer and microwave oven…etc. If you use a flat HDTV, please go through your tv manual to make sure your TV comes With built-in tuner for free view. Make sure you are using a HD receiver; otherwise no HD channels can be picked up. Please read receiver manual. you need to retune your free view TVs and digital receiver form time to time to ensure your are receiving all available services. Retuning takes only a few minutes and can be done with your remote control. TV reception capacity depends on the distance among your hone, transmitting tower and Surrounding environments. For maintenance of the antenna, please use soft cloth with diluent mild detergent to clean its shell.